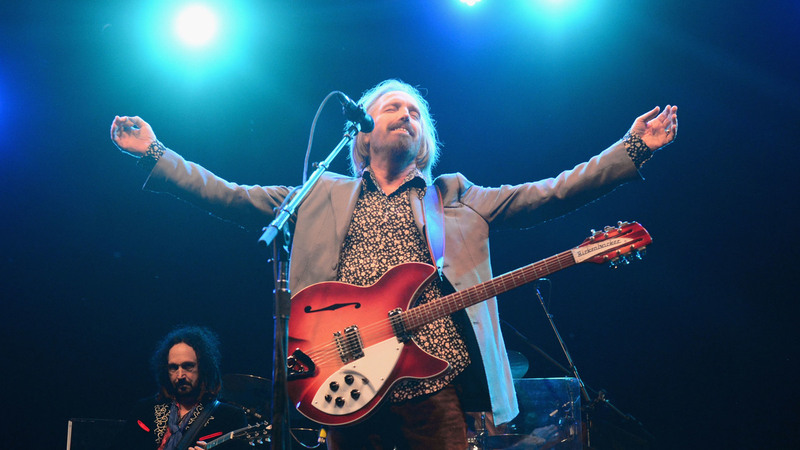 Tom Petty: The Fresh Air Interview Petty, who died Monday night, spoke with Terry Gross in 2006 about the seeds of his Hall Of Fame career: "We always wanted very much to create our own sound." Tom Petty performs with The Heartbreakers at the Bonnaroo Music and Arts Festival in Manchester, Tenn., on June 16, 2013. Tom Petty, leader of The Heartbreakers and member of The Traveling Wilburys, died Monday night from cardiac arrest. The Rock and Roll Hall of Fame inductee was 66 years old. Petty told Fresh Air in 2006 that he drew on the music of The Byrds and The Beatles in the hopes of developing his own distinctive guitar style. "We always wanted very much to create our own sound," he said. "I tried to take whatever influences I had and make them meld together into something that was our own sound. And we somehow did that. I don't know how." Petty and The Heartbreakers had a string of hits in the late '70s — including "American Girl," "Listen To Her Heart" and "Don't Do Me Like That" — but he told us it was his 1989 solo hit, "I Won't Back Down," that seemed to really resonate with his fans. "It's turned out to be the one song that's had the most influence on people that approach me on the street or talk to me in a restaurant," Petty said. "It's been really important to a lot of people in their lives." For his part, Petty was touched by the way his music moved his fans: "I know the songs mean a lot to people, and it means a lot to me. ... The rock 'n' roll stuff is more than just something that you can manipulate into advertising or whatever they do with them. It means more than that to me." On growing up in the college town of Gainesville, Fla. I was in the redneck, hillbilly part. I wasn't part of the academic circle, but it's an interesting place because you can meet almost any kind of person from many walks of life because of the university. But it's really surrounded by this kind of very rural kind of people that are — you know, they're farmers or tractor drivers or just all kinds of — game wardens, you name it. So it's an interesting blend. My family wasn't involved in the college. They were more of just your "white trash" kind of family. And so I have that kind of background, but I always kind of aspired to be something else, and I made a lot of different friends over the years that were passing through. The hardest one was "Get Off My Cloud" by the Stones. It had so many words. ... It took us a good three hours to get that one written down. But it was that kind of thing. It was a friend and something that was there. You didn't really think about it that much, but looking back on it, it was such a musical education. I had an uncle by marriage who was ... very into film. He was the guy in town that developed all the film and he had a movie camera. He used to film the college basketball practices and football practices, and when a movie came nearby — as a lot of them did around northern Florida — he would usually hire onto the set and work in some capacity. I don't remember what he said really, but I was very impressed by it. And when I went home, I kind of scoured the neighborhood and came up with some old Elvis records, and I started listening to them, and they really took me over. I didn't think you could just become a rock and roll singer. I didn't see how it could happen, because you needed to be in a movie and have the music appear on the beach and stuff. ... So when I saw The Beatles, it sort of hit me like a lightning bolt to the brain that, "Oh I see. ... You have your friends and you all learn an instrument, and you're a self-contained unit. This is brilliant, you know. ... This looks like a great, great job to me." And apparently it did to lots of people, because very quickly after that, there were bands forming in garages all over town. And I was just one in thousands of little bands that started then in around '64, '65. It was a pretty horrific thing to happen. And I did just survive with the ... the clothes on my back. But I don't know, maybe [the fire] had something to do with the song, like "I Won't Back Down" and things. Because I felt really elated that they didn't get me. ... The thought that was going through my head [was] "Whoa, you bastards, you didn't get me." I never really talked about that, because it stunned me so, so deeply. And I'm sure it had a great effect on the music I did, because I came back with this very positive, happy kind of music, that I didn't want to go into any dark corner or anything like that. I was just so glad to be alive and to have escaped something like that. .. It was also really traumatic and terrible, but part of it made me really be extra glad to just be alive. Bridget Bentz, Molly Seavy-Nesper and Otis Hart adapted this interview for the Web.